Dr. David W. Eisele is Professor and Chairman of the Department of Otolaryngology – Head and Neck Surgery at the University of California, San Francisco. He holds the Irwin Mark Jacobs and Joan Klein Jacobs Endowed Chair in Head and Neck Cancer and is the Director of the Head and Neck Cancer Program at the UCSF Helen Diller Family Comprehensive Cancer Center. He also serves as President of the Medical Staff at UCSF Medical Center. Dr. Eisele was born in Watertown, Wisconsin but grew up in Clearwater, Florida. He attended Dartmouth College, where he was active in the Sigma Alpha Epsilon fraternity, and graduated in 1978. He then graduated from Cornell University Medical College in 1982. 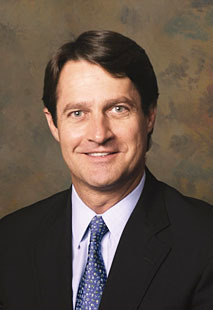 He completed residency training in otolaryngology – head and neck surgery at the University of Washington. Following his residency training in 1988, Dr. Eisele joined the faculty at Johns Hopkins University School of Medicine where he became Professor of Otolaryngology, Professor of Oncology, and Professor of Anesthesiology and Critical Care Medicine. He was the founding Director of the Johns Hopkins Head and Neck Cancer Center and served as Director of the Division of Head and Neck Surgery. In 2001, Dr. Eisele joined the faculty at the University of California, San Francisco. Dr. Eisele’s clinical interests include benign and malignant tumors of the head and neck, with special interest in oral cavity, oropharyngeal, salivary gland, and thyroid gland neoplasms. His research interests have included functional stimulation of the upper airway, electrophysiological nerve monitoring, dysphagia, and head and neck cancer treatment outcomes. Dr. Eisele has three daughters, Leigh, Lauren, and Mariel, and is married to Janice J. Eisele, Assistant Vice-Chancellor of Medical Development at UCSF. In his spare time he enjoys surfing, sailing, music, travel, and reading. The focus of Dr. Eisele’s presidential initiatives this year has been medical professionalism. It is his hope that the American Head and Neck Society will be a leader in organized medicine in this area.